One of the beautiful parts of Christmas are the traditional Christmas trees. I still prefer the real kind and usually try to have one in my apartment. But this year, because I'm going to be away, I am only having my small gold decorative tree. When I put it up, with special small decoration and a string of lights, it looks very pretty and is just as satisfactory as a real tree. These days many people prefer the imitation trees (much less trouble) but there is something about the scent of pine and cedar in the air that is missing when you use an artificial tree. (So yesterday I bought pine-scented candles to make up for it!). Two weeks before Christmas. The tree lots are full of fresh-cut firs and pines. Families make special outings to pick this year's tree. Around the city, coloured lights shine heralding the Yuletide. Christmas season, displaying showcase homes with plump trees bedizened with extravagant decorations. Some trees are sprayed gold or silver. And under the dazzling branches are heaps of designer-decorated packages. I am reminded of other Christmas trees. MY Christmas trees. Although perhaps not so grandly decorated, they are distinctly memorable and remarkably special. At home I open a box of photo albums and take a nostalgic trip to Christmases past. in a black-and-white photograph, hand tinted by my mother, is Tree Number One. My first Christmas tree: a spindly fir garlanded and hung with lots of tinsel and ornaments. Under its thin branches are the toys Santa has left. In front of the tree, on a little rocking chair sits a large doll with a frilly bonnet and pink dress. Next to it is a doll crib filled with stuffed toys and more dolls. Two stockings hang on the red-brick fireplace behind it, one lumpy with fruit and candy, the other a store-bought stocking full of surprises. In another photo, taken several years later, the tree has ivory-soap 'snow' on the branches and garlands of popcorn and cranberries. My Mom enjoyed creating special effects for our Christmas tree. Under it are two dolls in highchairs, the boy dolls our mother lovingly sewed wardrobes for. Mine was named Tommy. Every Christmas was magic when I was a child, a splendid family affair with a house full of visiting relatives and good cheer. Even when we grew older, each year at tree decorating time, it was a special family get-together with mom's delicious Christmas cookies, ginger ale and popcorn for treats as we dipped into the box of decorations and drew out a bauble for the tree. It was a time of nostalgia too, because each ornament had its own little memory attached. When I grew up and had children of my own, their tree always had some of the decorations they had made: toilet-roll angels with cotton-batting hair and gold wings; egg-carton bells painted red and green and glued with sparkles; cut-out trees with sticker decorations. One year we had a cookie-decorating contest. We baked sugar cookies, decorated them, and hung them on the tree. The most elaborately decorated cookie won. We saved the best one. They lasted a year or two until some mice discovered them. Another year we set out a box of ribbons, glue, paper and sparkles and invited each guest that entered our house to make a special decoration for our tree. Sometimes, other things had to make do for Christmas trees. The year I was going away to California to attend my daughter's wedding, my avocado plant served as a tree, hung with tinsel and silver balls. Another time, when I was living in a cramped bachelor suite, I decorated my ficus plant with lights and tinsel. The year I went to live in Greece, I bought a small laurel plant and decorated it with tiny lights and baubles. I still have a few of the old treasured ornaments, and every Christmas as I unpack the decoration box to trim my Christmas tree, I am filled with nostalgia, remembering Christmases past: the chenille wreaths from my childhood trees, the expensive silver and gold globes bought to decorate the first tree shared by my husband and I; our children's special ornaments -- little ceramic bells collected on my children's visits to Santa Claus; special little gift ornaments made by friends; starched snow-flakes crocheted by my daughter; ethnic decorations from Mexico and China given to me by newcomers at the daycares where I have worked. I always look forward to Christmas, especially to the tree decorating time. Some of those old ornaments are getting tattered and tarnished. Each year I have to part with a few, but each year I buy one new ornament to replace the old. "Oh Christmas Tree, Oh Christmas Tree, how lovely are your branches!" Aunt Grace's home) for a big turkey dinner, lots of fun with skits and board games, and nothing stronger than gingerale to drink. They were truly merry affairs and looking back I miss those days. 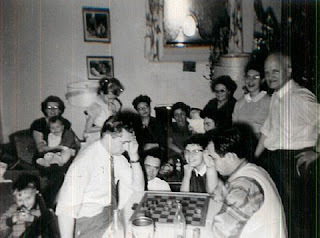 In this photo, there's my Uncle Frank, the joker playing checkers with my husband Mike while cousin Adele and cousin Gracie's husband Gordon looking on. Gracies' son David is playing behing them. My son Stevie is just a year old, sitting on my cousin Gracie's knee. My dad, cousin Merilyn, Mom, a friend holding Gracies baby Caroline, Aunt Grace and cousin Lynette are in the background. When I first married Mike, I was introduced to his Ukranian family, and it was quite a different kind of Christmas celebration for them. Here's a story I wrote about that experience. This is the way my Christmases always were in my family. And I thought it that way for all everyone. What a surprise I got when I got married and was introduced to Christmas at the Ukrainian in-laws. The first time my husband took me home to spend Christmas with his family I was shocked and amazed. It was my first introduction to a hard-drinking, hearty-eating Ukrainian way of celebrating the holidays. These days Christmas has become even more commercialized with all the hype of shoppers rushing to the malls to buy! buy! buy! But it wasn't always like that, especially in my family. Right from my childhood when my parents earned a meagre living (Dad, an immigrant coal-miner from Wales, was a pastor on the Prairies at the end of the Depression and during the War years my mom, sister and I lived with my grandparents in Stratford Ontario. 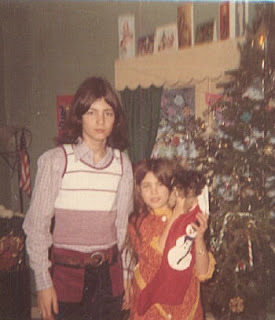 Christmas was always a big celebration in our home, no matter what, and many of the gifts were lovingly home-made as there simply wasn't a lot of money to spend. Because of this family background, when things got tough for me and my kids, after the break-up of my marriage, we were still able to enjoy the holiday season even though "living on a shoe string". Here's a Christmas memoir I wrote a few years ago. 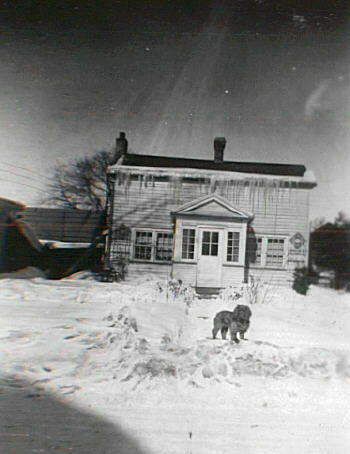 "FAMILY PHOTOS: A View of Christmases Through the Years"
My mother enjoyed photography as a hobby. Our family albums are crammed with black and white snaps taken with her Brownie box camera, some hand-tinted with pastel colours. browsing through them, I am transported back in time to Christmases past. The first Christmas photos, Estevan Saskachewan., I'm an infant in a wicker pram, wearing an angora bonnet. My mother's tidy handwriting on the back says "Ruthie, six months old. She's wearing the bonnet Aunt Edie sent from Wales." In another, I'm propped up in a wooden box on the back of a sled. My father, dressed in his fedora hat and overcoat is posed beside me. In Dad's unique, tight handwriting, is written: "Ruthie's first sleigh ride. I made the sleigh." 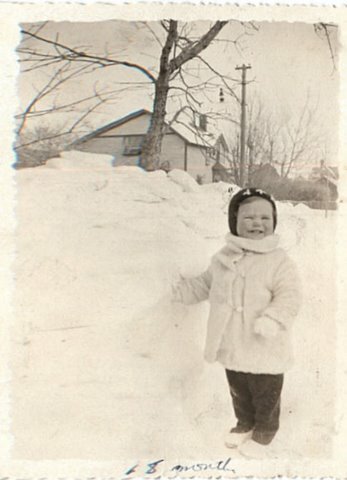 Next year, I'm an 18 month old dumpling, podgy as a little snowman in knitted leggings, sweater and bunny-ear hat, knit by Mom. Next to this picture is one of a Christmas tree piled with decorations I can remember using for years to come, and piles of gifts including a doll in a pram and pictures books. A few years later, another Christmas tree, this time with identical dolls sitting in high chairs and a Red-Rover sled with shiny runners. By now I have a little sister, so each year Santa brought us identical gifts. She liked dolls better than I did though. I preferred paper-dolls. There is always a lot of snow in these pictures: Lloyminster,Saskachewan. My pal Albert and I, age six, standing arm in arm in the back yard under bare-limbed trees with snow up to the tops of our galoshes. Me wearing the coat Mom had made me out of a hand-me-down: moss green wool trimmed with Persian lamb from one of her old coats. I'm still wearing that coat three years later in another photo, this one taken by a photographer for Santa, the year we went to Toronto to see the Sant Claus parade. This photo invokes clear and rather unpleasant memories of that Christmas. I was nine then. We had moved from the Prairies to Brantford Ontario and then to Stratford when my father was called up as an army chaplain. We lived at Grandpa and Grandma's house while Dad was overseas. In a photo she had taken to send Dad, my mother stands on the front porch steps wearing an elegant crepe dress, her hair neatly coiffed in the fashion of the '40's, smiling. Behind her, on the door, is a big silver bell with red writing: "Merry Christmas". Those Christmases without Dad must have been lonely for her, but she never showed us anything but her sweet smile. Christmas at my Grandparent's house was a joyful, exciting event with visiting relatives who arrived by train from other parts of Ontario, and a house full of cousins and Christmas cheer. That particular Christmas, Grandpa promised us we could go to Toronto to see the famous Santa Claus parade. It would be a special Christmas outing for the whole family. We would take the train in the morning and return that night. It was an adventure I had longed for and I was beside myself with excitement for days before the scheduled departure. Then, on the eve of our journey, I took ill with the flu. I was very sick, but determined not to miss the trip. I don't remember the train trip or the Santa Claus parade. I look at myself in the photo, puffy-cheeked and pale, totally wretched, sitting on Santa's knee unable to smile. I still haven't forgotten how ill I was that day, and how disappointing it was to have such a special outing spoiled. The next year's Christmas photo shows us standing on Grandpa's steps with my Dad who is beaming proudly in his army great-coat and beret. My little sister Jeanie is on one side of him. She has a doll in her hand. Twelve-year-old me stands on the other side of him, skinny, long-legged and solemn. Behind us is a spangled sign that says: "Welcome Home!". That was our last Christmas in Ontario. The following year we took the train across Canada and made our new home in British Columbia where Christmas wasn't always white, although I can still remember skating on the Lagoon and singing carols door-to-door in the snow. Wherever we were, Christmas was always special in our family, with beautiful decorations, the aroma of Christmas baking, pine logs on the fire; Christmas music, and a tree we always decorated together with heaps of surprises wrapped in colourful paper under it. Santa always found us, and filled our stockings, even when my sister and I were grown up and had little ones of our own. In her photographs, my Mother has captured all these memorable times and left us this legacy of Christmas with the Family. Christmases Past. was upset with me for ‘wasting’ my money on such foolish toys as these instead of buying something more ‘practical’. I felt embarrassed and disappointed. However, it was too late to return the dragons to the store, so I wrapped them up and put them under the Christmas tree with the other gifts.